A tale of dark age witchery and magik. Loosely based and interpreted by the author on the account of Brother Piran as written in The Blue Book of Bodmin. Supposed to have been transcribed by John of Tynmouth in 14th C.
"Ther was dwellynge in the contree, a wicche of gret and diverse powers." In the southernmost regions of the country of Cornwall there once lived a woman of uncommon knowledge. She was known to be one Carlin Tretheen though whence she came was a mystery to her neighbours. It may be that among the spirits of the night she had another name but if she had, it was not then or ever known. The local inhabitants talked of her in hushed whispers and if they must pronounce her name would call her only: The Witch of Kemyel. Little of her history ever came to be known save only that she was married in a Christian church to one Hobba Tretheen. Shortly after, their village had fallen to the raiders from the sea, those barbarous people of the northern lands who came in their dragon boats to plunder and pillage our shores. Her husband was taken for a slave and Carlin would have met this fate too had it not been for the ferocity of her husband's defence, giving her time to escape into the expanse moorland that lay behind the village. For many years nothing was known of Carlin. Then about the year 988, rumours started to be heard of a creature of the night that had taken up residence close to Kemyel in the far southern reaches of the Cornish peninsula. It was said by the locals of Kemyel and the other nearby villages that this creature could only be seen at night and then only when the moon was dark or dim. More than one of these stout country folk related hearing the "chanting and screaming of the devil" as they had passed through the region, though what their business was there at these times, I know not. My duties to the Priory of St. Petroc in Bodmin required me to investigate, validate and, where possible repudiate all matters pertaining to supernatural happenings in the area. To this end it was in the year 992 that I, Brother Piran, ventured forth from the safety and seclusion of my cell, taking with me a novice who was in my care, in search of Carlin Tretheen. "To the place of Seinte Maderne near Pen Sans wher water most holy spryngeth forthe." We journeyed on foot for though I had a mule it mainly served to carry our supplies. In all it took some ten days for us to reach St. Maderne's. This was a holy place to the north of Penzance where there was a small chapel situated near a Holy Well. It was only a few miles from there to our destination and I knew the incumbent to be a particularly pious man and wished my novice to become acquainted with him. I also wished that we should bathe and be cleansed in the Holy waters of the well. This region is still most pagan in its beliefs and in spite of the sanctity of St. Maderne, or perhaps because of it, the locals practised a custom of bringing offerings to the old gods at this place. These offerings would most often take the form of a piece of cloth, torn from a favoured garment, or figures woven from straw or other natural fibres. For the people who brought them each would represent a supplication to the "Genius Loci" though what that supplication might be could not easily be ascertained. My novice, Benedict, was truly curious as to their nature and examined many, diligently recording their construction and components for later comparison and study. At the rising of the sun two days later we set forth once again on the final leg of our journey. As the Chough would fly the distance to Kemyel was only a few miles but the going was difficult and I did not expect to complete the journey until late in the second day. Well this was for we were obliged to stop and wonder at the many marvellous structures that are scattered across the land hereabouts. We made our way across Tregarvah Moor and crossed the river at Drift around midday. Standing like ancient guardians, two large menhirs marked our trackway southward. "Gyfts of diverse pagan figurs about the place wer stroone." Though already affected by the antiquity and size of the structures, we were still unprepared for what was to come. Barely a mile on, standing close to a group of rude dwellings known as Tresvennick, stood a mighty pillar of stone. More than twice the height of a tall man, it dominated its surroundings. It was obvious to me that this place was still very much the centre of some local pagan tradition, since the remains of offerings and carvings of pagan symbols and creatures littered the ground. Since the Sun was beginning to sink low in the sky I sought shelter for my party among the people of this place. The inhabitants of Tresvennick were not at first disposed to be hospitable but became more so when they discovered that we were not there either to berate or convert them. They were a pagan brood, and several times during that evening I had to instruct Benedict to close his ears to the un-christian pronouncements that were made as we ate with them. As the following day broke it brought the worst of Cornish weather. Driving rain strove to keep us from our path. Of the sun there was no sign. In this we began the final leg of our journey with our hoods up and faces buried deep to protect against the stinging rain. When the rain let up that day, the air stilled and a fog crept in so thick that our voices seemed to die on our very lips. On departure I had given our host a few coins in thanks for the shelter and food, which he seemed to appreciate, and my blessing for his family which, unsurprisingly, he did not. We made better time that day than I would have expected and around two hours after noon took shelter amid the remains of some stone hut dwellings, long since abandoned by our ancient forebears. And though little was now left other than the walls and a fire pit they nonetheless provided good defence against the elements. As we made our meagre camp the clouds began to lift and a weak watery sun brought small warmth to our bones. I stood upon the wall of one of these ancient dwellings and cast my eyes to the south. There in the distance I could make out the sea, glittering in the strengthening sun. I knew that we must be close now to our destination. Well it was that we had chosen to take set camp in that place. For if we had not, I doubt that we would have found our quarry, or witnessed those strange events which took place but a short time later. "Then certyn sownds of a soule unrested did fil the nyght." I was woken by Benedict shaking me. His face, what little I could see in the remaining glow of the dying fire, showed great fear. "Brother," he said, "hearken to the wind." I shook the drowsiness from my mind and cast my ear to the night. Sure enough, I could discern the sound of a voice, which I took to be human, carried on the night breeze. "It's closer now," said Benedict, clutching harder at my robe. "Fear not." I replied, "for I am here and the Lord is our protector." I slowly raised my head above the level of the stone wall that formed our temporary habitation. I held my breath and motioned for Benedict to stay silent. As my eyes and ears became accustomed to the night I became aware of the direction whence the unearthly voice came. The cloud above thinned a little, allowing a small amount of additional light to filter through from the moon. By this weak light I could make out a figure. Hunched beside another of those ancient menhirs was a woman, faced raised to the night sky, incanting some charm, I guessed, though for what purpose, I could not. A cold fear started to work its way into my heart. The figure rose and turned towards me. An impossibly long arm seemed to reach out towards me until its hand was only a few inches from my face. One long boney finger stretched out. The palm upturned and the finger crooked in an unmistakable gesture of beckoning. I steeled my will, quelled my furiously beating heart, commanded Benedict to remain and, with a silent prayer to Our Lord, clambered over the wall and followed the receding figure away to the south. The figure of Carlin Tretheen, for I knew it must be she, glided across the rough ground where I, a mere mortal, stumbled and fought to stay upright. And it seemed to me that every time I stumbled there was a tinkling of laughter on the night breeze. Then as if by some supernatural agency, she vanished from my sight. As I stumbled on, the earth appeared to give way beneath my feet and I was falling into darkness and the unknown. "Thus the wicche did speyke hir wyl in ernest." The fall was not far but even so, knocked the breath from my body. For a few minutes a wondrous maelstrom of small stars were all I could see. Slowly, my breath, and with it my sight, returned. There before me, illuminated by the dull light of a solitary candle, squatted Carlin Tretheen. "So, Brother Piran, you have come at last." She spoke in Cornish and I thanked the Saints that this was also my own native tongue. "You were expecting me?" I queried. "Oh yes," she replied. "My spirits told me of your departure from Bodmin some twelve days ago." She paused for a moment. "But I have seen you in the candle's flame many times over the recent months." I gestured with my hand the sign of the cross. She laughed. "As was foretold," she said without hesitation, "you have come to aid me against the raiders from the sea." She went on, "I have watched them coming from the Black Rock high above the cove. I have seen the moonlight glinting from the shields on the sides of their ships. I have heard the plans of their leaders whispered on the night wind." She paused for a moment as though in recollection. "They come with destruction in their hearts and minds and there are none hereabouts who may stop them." She looked at me slyly. "Unless it be you and I." Puzzlement must have shown in may face. "You do not believe me ?" she said. "No matter. I will prove myself before the end. But know this," she stared into my eyes as though it was in her power to see into my very soul. "Yesterday I raised a storm and held them fog bound to delay their coming." She once again pointed that long finger at me. "For you were late and tarried on the way and I and my Gods will not be thwarted. Now we can do no more this night, so return you to your acolyte. He is much afraid." I didn't leave immediately. I was too fascinated by her desire for my assistance but she would not be drawn on the subject. She would only say that I need not fear for my soul. This at least was some relief for I was beginning to think that I had become an unwitting player in some pact of hellspawn. In the remaining hours before dawn I questioned her concerning her history, verifying the reports that, I still believed, had drawn me hence. She told me, how on the night her husband had been taken, she had lain at the foot of the great stone where I had first seen her. As her blood had seeped into the ground she had sworn her life to vengeance against those that had taken her man and caused the death of her unborn child. She had unwittingly called to the ancient spirit of the place, who had accepted her blood offering as part of a bargain that would enable her oath to be fulfilled. Now she had power. But the price was great. She was forbidden the sunlit hours. Should she be abroad after dawn then her body would transform to become part of the land, and her spirit would descend to some other place for all eternity. This was the trade and she had accepted gladly. I asked if there was some way for her to avoid this fate. I offered her the surety and protection of Our Lord if she would allow me to bring her back to the Christian church. She laughed harshly and told me not to be so foolish. For a moment in the candlelight I saw a glimpse of the woman Carlin must have been. With an unexpected softness she said, "No, it is too late for that. I have seen my end and am not afraid." There was silence between us. At last she said, "Dawn is near. Go now and return again at dusk." She motioned me to stand. "Bring your boy with you when you come." I did not see what she did then but the air swam before me and somehow I once more found myself standing on the open ground. In the spreading light of the early dawn I could discern a large square slab of dark stone in the ground at my feet. I knocked on it, tried to lift it, and even kicked it but it did not move. Indeed there was no evidence to suggest that it could, or ever had been moved in any way. "And at oure prayere we wir somtyme." I slowly made my way back to the circular structures. Benedict was fast asleep and awoke with a start when I gently shook him. "Brother, where have you been? Are you alright? What happened?" the questions tumbled from his lips. Concern and fear showed in his eyes. "I had thought you would not return," he went on, calming. "Don't worry, " I said, "I'm quite alright. Apart from being a little tired I suppose," I added. "Perhaps you could re-kindle the fire and keep watch for a little." I sighed, " I doubt we will be troubled today, but I must sleep now." He looked at me with more questions burning on his lips. "I'll tell you all about it when I wake," I said. "Also, I think then we will attend to the cleansing of our souls since we have been somewhat lacking in devotion recently." I closed my eyes and knew no more until the sun had begun its descent through the long afternoon. From the amount of ash in and around the fire pit Benedict must have fulfilled my last request most dutifully. I pondered quietly how far afield he must have travelled to obtain enough suitable firewood. Even as I mused on this he appeared through a break in the wall which must once have served as the doorway. A large bundle of wood was strapped to his back. He built up the fire once more and I began to relate all that had transpired the previous night. His eyes grew wide as I told the tale and again I saw a glimmer of fear lurking in their depths. Only once did he speak during my narration. "Brother, are we safe to be consorting with such a witch?" I answered slowly, for only then I realised that our help had not been asked for but expected, as though no earthly force could prevent our collusion in the coming events. "We must keep our faith in Our Lord." I said. "And be sure that whatever happens, his hand will be upon us." He looked only partially assured. "Now," I motioned for him to join me. "We must see to our devotions." And so until the Sun was low on the western horizon we prayed, kneeling together beside that ancient monolith that had no doubt witnessed rituals of many different natures since its erection so many years before. We prayed to our Christian God for his guidance and protection in the night to come. As the last rays of the Sun disappeared we approached the place that I knew to be the abode of Carlin Tretheen. The great square of stone seem to have taken on the hue of midnight in the darkening light. It was as though it were Nothing given shape. We both jumped and Benedict screamed quietly as Carlin rose from the ground through the blackness. "You," she pointed at Benedict, "stand guard here and though you have no weapon and it should cost you your life, let no one enter my home." She went on, "Be warned, look not at nor listen to anything that might occur within. But pray with all your soul to your god to keep this place sealed tonight." She touched him lightly on his forehead and a kind of calm seemed to settle across his features. "Come with me," she addressed me. "You must be my witness." Darkness was gathering and her face was partially hidden yet I thought that upon her cheek a faint moistness glistened. "Here," she said, "take this bottle. If at the end there is no hope for me, break it upon the ground." I took the bottle. It was earthenware, carved with many strange devices and sealed with heavy lead. "It contains a spirit," she continued. "I have promised it freedom in exchange for its aid". Then suddenly fierce she said, "Do not fail in this, priest. Now come. We go to Kemyel, for that is where all deeds shall be done, and we shall see if they be enough." "And sometyme spellynge with hir gret powers, she caughte hir enimys." When at last we stopped we were at the head of a small valley leading down to the coast. The valley, no more than a crease in the land, was shrouded in darkness, darker than the night above it. "This is the way they will come," she said. "We will wait here." As the night drew on she became more and more agitated. "This cannot be," she said. "There will not be enough time." She stood up and lifted her hands to the night sky. "Bring them now!" she uttered commandingly, though to whom I knew not. After a few minutes she whispered, "They come. Be ready, watch and follow, and remember what you must do." Silently she moved away. I saw her appear as a ghostly silhouette against the night sky, a few yards away atop a wall. The first of the raiders appeared out of the dark of the crease. His conical helmet with its protruding horns would have betrayed his heritage if his terrible visage had not. He and five others like him moved swiftly into the field. Suddenly there was a warlike cry in the distance and where Carlin had stood there was now what appeared to be a small band of warriors. The raiders were distracted and in that moment two bolts of blinding light flashed across the land. Two of the raiders were frozen where the light struck one of them bent in the act of knotting a loose fastening around his ankle. The two seemed to glimmer slightly as though the light had cast an eerie nimbus around their bodies. I marvelled at Carlin's power to hold them so. Carlin and her ghostly band set off across the fields, seeming to be carried on the wind. The other raiders took one look at their comrades and set off in hot pursuit. I gathered my robe about me and, clutching the bottle, I set off in pursuit of the lot. I crested a slight rise in the ground to see another bolt of light streak across the sky, and another raider ceased to move. On they ran, hunted and hunters. Was it my imagination or was Carlin's group fewer than before? It was not my imagination, I realised, for as each raider froze so one of Carlin's company would vanish. "God in heaven," I cried, "what spell could do this? Lord save me from damnation this night." Then I realised a faint light was breaking in the east. Dawn would come at any minute. From my vantage point I could see Carlin and her pursuers. They were in a valley and would not yet be able to see the light. I screamed, "Carlin!" Her head shot round though she could not have heard me. Frantically she started to run for home. One last lightning bolt flashed out. Now there were only two raiders remaining. With a huge leap Carlin crested the last wall before her home. I could see, a few yards in front, Benedict praying on his knees, eyes raised heavenward. As Carlin topped the wall the first rays of the morning sun illuminated her fleeing figure. For a moment she seemed to be frozen in a shimmering brightness, bur as the sun rose further the full truth became apparent. Carlin, as she had predicted, had been returned to nature. 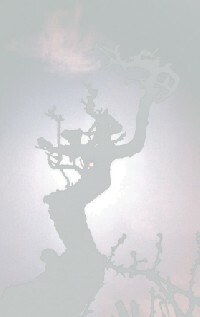 There on top of the wall now stood a twisted thorn tree in mimicry of the fleeing woman. For a moment it was a though I too was spellbound. Remembering my wits I dashed the bottle to the ground. It exploded in a thousand fragments and a black spectral cloud escaped from it. The cloud raced across the land to where Carlin had stood. As it travelled it seemed to coalesce into the shape of an enormous black hound. Surely we would all now die at the mercy of the fiend from hell, I thought. The hound reared in front of the remaining raiders. With its mighty paws it smashed them to the ground and slew them instantly. Then without a backward look the hound charged down the crease. In a few minutes there came more screaming and the sound of timbers being smashed upon the rocks far below. Then there was silence. Neither the raiders nor their ship would ever sail again. From my vantage point I surveyed the land and paused to wonder at the raiders upon whom Carlin had worked her magic. Then I realised the true nature of her spellcraft, for as each had been frozen she must have imparted a small part of herself, and so as the sun's rays touched them each of the raiders was turned to stone. There they remain still, scattered across the land; the silent witnesses to a witch's sacrifice and determination. To this day I do not know what happened to Benedict on that fateful night. It was some days into our journey back to Bodmin before the haunted look started to fade from his eyes but never has he told what befell him. He completed his noviciate and, liked so many, became tonsured. I think this brought him some relief for it meant that neither he nor others could see the shocking white slash of hair that went from forehead to crown, revealed in that same sunrise that brought the end of Carlin Tretheen. For myself, the image of Carlin frozen on that wall still haunts me. In my travels I have visited the place twice since then and the thorn continues to flourish. For some time rumours concerning a black beast roaming the cliffs in the dark hours continued. But there have been no raiders in Penwith since that time. Some five years have passed since the events related here took place. Now the same threat has again become very real on our northern shores. And strangely, as I look out from my cell window over the moorland with its ancient stones in their silent dance, I believe that I can hear the howl of a animal on the moaning wind, and glimpse from the corner of my eye the merest suggestion of a great shadowy beast.